Green Humour: Bird caricatures- published! 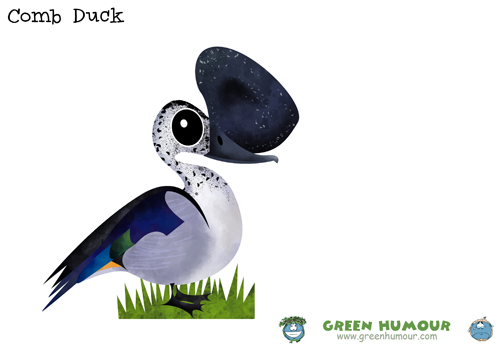 I've got some great news for readers who are following my bird caricature series- these are now a part of Saevus magazine's section, 'Go Birding' written by eminent Indian birder, Mr. Sumit Sen. Beginning with this Comb Duck above, these caricatures will appear one bird family at a time in each issue. I am also set for the Arunachal Bird Festival, where I will be displaying prints of some of these bird caricatures from North-East India. I will be speaking on art and biodiversity and will also be deconstructing one of these caricatures to explain the process to students and other audiences. Prints of these are available as A3 posters which you can order by sending a mail to me on rohanchakcartoonist@gmail.com. I may be out of coverage for the next one week, so I'll get back to all messages and emails once I'm back.